2 February 2017- Mangrove forests that incorporate local communities into their management fare better, a new study finds. Recognizing the importance of gender and community rights in mangrove use and planning prevents the deterioration of these fragile ecosystems. These are some of the conclusions of a new global study on mangrove governance from The Center for International Forestry Research (CIFOR) released today, on World Wetlands Day. Scientists conducted a review of international literature as well as case studies in Indonesia and Tanzania. Discover the main research findings here. According to the study, mangrove forests are overwhelmingly managed by government institutions. They often fall under the jurisdiction of multiple ministries, from the Ministry of Forestry to the Ministry of Fishery, creating a maze of vague responsibilities that deliver little protection on the ground. 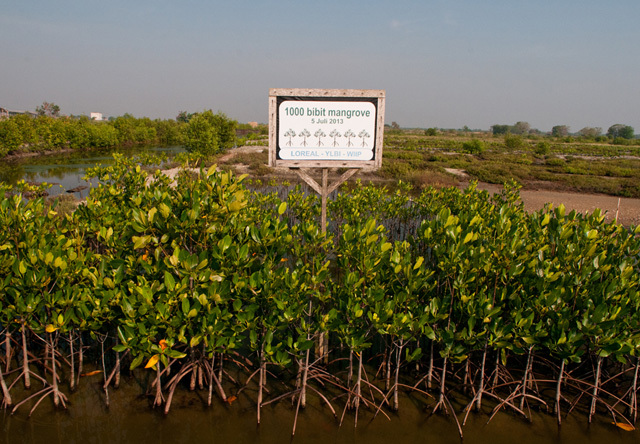 Typically, mangroves are classified as protected areas, but officials often lack the resources needed to effectively protect them. Compounding this challenge are local communities who continue to be active users of mangrove forests, but who do not have clear or documented rights and incentives to sustainably use or protect them for the long term. “Despite government intentions to manage them sustainably, governance regimes are generally ineffective at conserving mangroves because they generally fail to involve communities,” says Steven Lawry, CIFOR’s Director of Forests and Governance Research, who worked on the report. What’s more, gender equity remains a missing element in mangrove conservation. “In the literature review there was hardly anything on gender, and then when we looked at the ground level we saw exactly the same thing – a widespread gender blindness in mangrove management,” says Esther Mwangi, Principal Scientist at CIFOR who helped lead the study. To date, research on mangrove forest management has focused on the ecological aspects of restoration. Little analysis exists about the ways land governance, resource rights, and land use planning — the social aspects of the conservation challenge — affect mangrove restoration. This new study aims to change that, supporting a shift to mangrove forest management models where coastal communities have a more active role. Countries are slowly recognizing the importance of identifying mangrove management approaches that deliver results on the ground. In Tanzania, there is a growing recognition of the weakness of top-down mangrove protection approaches. Joint forest management and group rehabilitation schemes with local communities are increasingly being proposed in an effort to foster more community-led management. In Indonesia, local community leaders are spearheading mangrove conservation efforts after understanding the ability of mangroves to protect their coastal homes and livelihoods. The CIFOR study forms part of a broader study that includes national-level assessments in Indonesia and Tanzania. It was carried out under the USAID-funded Tenure and Global Climate Change Program.